16 I pray that out of his glorious riches he may strengthen you with power through his Spirit in your inner being, 17 so that Christ may dwell in your hearts through faith. And I pray that you, being rooted and established in love, 18 may have power, together with all the Lord’s holy people, to grasp how wide and long and high and deep is the love of Christ, 19 and to know this love that surpasses knowledge—"
In a previous article, I shared that in order to appreciate Paul’s prayer for the Ephesians, we first needed to understand his requests. Paul asks for two things: One, that Christ may dwell in the hearts of the Ephesian Christians through faith; and two, that they might grasp and know the infinite love of Christ. At first reading, those two requests don’t sound like huge requests but they are. Let’s begin by looking at Paul’s first request and what he means when he prays for Christ to “dwell” in their hearts. When a person initially places their faith in Jesus as Lord and Savior, they graciously receive the Holy Spirit (Acts 2:38-39; Romans 8:9-11). However, this initial giving of the Spirit is NOT what Paul is requesting when he prays for Christ to “dwell” in their hearts. In Paul’s prayer, he is asking that the Spirit who is already within them to empower them so that Christ may dwell in their hearts through faith. So, to have Christ dwell in your heart means something different than receiving Christ into your life. Side Note: Sometimes Paul writes of Christ in us and other times he refers to the Spirit in us. Who is it that’s in us, Jesus or the Spirit? Paul would answer, “Yes. Jesus is in you. And yes, the Spirit is in you”. This is just another example of the triune nature of God that we see taught in the Bible. To study more about this, pick up a copy of Wayne Grudem’s book Systematic Theology: An Introduction to Biblical Doctrine. You can buy it used at Amazon for about $26 (includes shipping!). Total deal dude! So, what exactly does Paul mean? First of all, in the Bible, the heart is not just your emotions and desires but it’s your entire inner life – your emotions, desires, character, beliefs, attitudes, etc. Second, in this passage, Paul is using the metaphor of a home to describe the heart (the inner life). In English, we don’t immediately see the metaphor but the Greek word “to dwell” is specifically used for dwelling in a home. This is why the New Living Translation paraphrases it, “Then Christ will make his home in your hearts as you trust in him”. 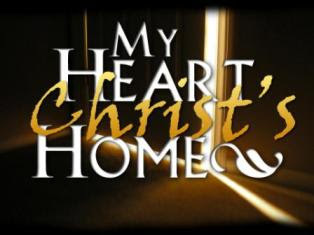 Do you remember the booklet, My Heart – Christ’s Home, by Robert Munger? I read that booklet YEARS ago in high school and this passage reminded me of it. Anyway, I looked it up online, purchased it on Kindle (only a $1.20!) and to my surprise, the opening sentences read as follows, “In his letter to the Ephesians, Paul writes these words: “That [God] … may grant you to be strengthened with might through his Spirit in the inner man, and that Christ may dwell in your hearts through faith” (Eph 3:16-17). Or, as another has translated, “That Christ may settle down and be at home in your hearts by faith (Weymouth). Without question one of the most remarkable Christian doctrines is that Jesus Christ himself through the Holy Spirit will actually enter a heart, settle down and be at home there.” BAMMO! I simply discovered the same thing that inspired Munger to write his booklet! Pretty cool, eh? So, Paul is praying that Jesus “make his home” in your inner life. That he make himself at home in your mind as you cruise the internet or scroll through social media feeds; that his pure and patient love take up residence in your marriage or premarital, romantic relationship; that his gentleness and mercy make himself at home in your words and tone of voice as you speak to your children or your spouse; and that his truth and priorities dwell in your values as you spend hundreds or even thousands of dollars each month on the resources he has asked you to steward. Paul is basically praying that you would be so filled up with the heart and soul of Jesus that you would beautifully reflect the glory of Jesus in EVERYTHING you say, think, feel, desire and do. That’s what Paul is praying for and that’s why he calls on God to strengthen you with power by his Spirit according to his glorious riches! For Christ cannot make his home in our inner lives apart from us whole-heartedly trusting in God’s Spirit to make it happen! In my next article, I will explain Paul’s second request.